Brandon Boxbaum is an antitrust associate in the firm’s Washington, DC office. He graduated from The George Washington University School of Law, where he was an associate for The George Washington Law Review and selected as a student attorney for the Small Business and Community Economic Development Clinic. 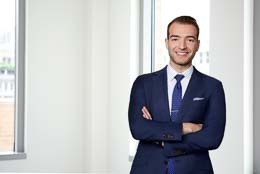 Brandon was a Janet Steiger Fellow at the Antitrust Bureau of the New York Attorney General, where he assisted in antitrust litigation and investigations. He has also worked as an analyst for ACG Analytics and served as an intern to Shabana Mahmood, MP, in London. Brandon graduated from Northeastern University in 2012 with a degree in Political Science. Brandon Boxbaum, Public Muscle and Private Profit: A Flawed Scheme for Stemming Foreclosures Through the Power of Eminent Domain, 83 Geo. Wash. L. Rev. 209 (2014).